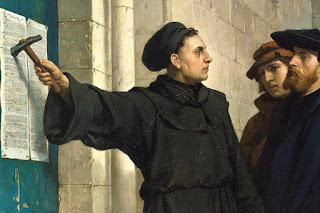 Luther and the 95 theses? Last time we saw how Martin Luther taught that self-knowledge is essential to the proper worship of God. He then went on to show that we need to know about God’s ‘character’ in order to sustain the life of faith. The phrase ‘knowing God’ is currently used glibly and sentimentally, as if God is a creation of imaginations. We can rely on God’s promises because God is immutable, unchanging. And not otherwise. If we know God, this is the God we know.If God is changeful as we are, he cannot function as the ‘rock’, and we would be in the business of anticipating what mood he will be in tomorrow, and what his plans are for the day. That God foreknows all things; that he is omniscient, and is immutable, are fundamental features, of who God is, features without which he could not be God. We may knowing that knowing God is having the sort of relationship with him that we may have with some other people. We know some people who, perhaps, we would prefer not to know. Is God like this? Or is he a projection of our fantasies, like something out of Tolkein or J.K.Rowling? Luther is telling us that the character of God is fixed, and that this character should control our worship, our hopes and fears and our obedience. Fundamental to our religion is not whether we know God but whether this God knows us. And whether or not we enjoy the fruits of his promises of grace and salvation. We are often told that God’s love is unconditional, but what Luther tells us means that we should be careful on that point. If we are not careful the attractions of unconditionality will sweep us away. If no conditions, anything goes. You can see that unconditionality appeals to the temper of the ages. Unconditionality, no responsibility? If anything goes, then anything goes with regard to God. But knowledge inevitably conditions. Luther insists that our relationship with God is shot through with conditions. There are conditions in our relationship with him. For example, if we are ignorant of who God is and what he does and has done then our condition will be that we shall not begin to know how to approach him. The doctrine of God is often rubbished as being abstract and ‘theological’ (as it is, naturally.) Whereas our knowing him is personal and intimate. Well, we must be careful. His omniscience or his immutability are not to be thought of as abstractions, the playthings of theologians, but as divine powers or perfections. Of course he has these powers necessarily or essentially. If he lacked any of them he would not be God. It is to be hoped that it is this God we know when we affirm that we know God. And so we ask the same question as in the earlier post. Do our preachers tell us such things? . Or are all sorts of other things more ‘relevant’? To neglect such things is not to teach them or to take them for granted. It is to bless our ignorance. Heard any sermons on these themes, on the object of Christian faith, and how that who God is the solution of many of the setbacks we have as a Christian? Heard one sermon in 2018 on such a theme? Without the knowledge of God our heads will be filled with the character and goals of our culture, and be filled with fear and stress?